Say what you will about Aaron Sorkin, lord knows everyone else has, and they’re not wrong either. Sorkin’s bread and butter is idealistic, densely verbose, walk-and-talk laden drama with a heavy lean towards whatever he wants you to believe at the time. And believe you do, Sorkin’s gift with getting actors to deliver slick monologues and/or snappy conversations with pure unadulterated earnestness is unmatched. His new HBO series “The Newsroom” takes these talents behind the scenes of a cable news show and the result is glorious. His TV skills blossomed with the short-lived “Sports Night” and solidified with the incredibly dynamic “The West Wing.” And while the quality of his shows vary wildly ( see later seasons of “The West Wing” which, in fairness, he did leave, and the crazy uneven “Studio 60 on the Sunset Strip”) the general “Sorkinyness” remains. With “The Newsroom” he tells the story of Will McAvoy (Jeff Daniels) the prototypical cable news anchor who, after a public meltdown of frustration meeting idealism, begins to take his news show in a new direction – reporting the news that people need to know honestly, accurately and with the goal of “raising the conversation” and helping to bring America back from the tabloid brink. For soapy goodness his ex-girlfriend McKenzie McHale (Emily Mortimer) is brought on to executive produce. The series follows their show, “News Night” as it rebrands itself and all the ups and downs that follow. John Gallagher Jr., Alison Pill, Dev Patel, Sam Waterston, Thomas Sadoski and Olivia Munn also star (Jane Fonda also recurrs). What makes this show unique is presentation. The timeline of the show begins in 2010 and each episode follows one or more major real-life news story and how the fictional news team handles it. From the oil rig disaster in The Gulf of Mexico, to the Egyptian change in regime, to last week’s excellent “5/1” covering the death of Osama Bin Laden; real life incidents provide the pulse of this show while the interpersonal relationships and big business concerns provide the drama of the series. The McAvoy character also is a rarely seen TV archetype: a republican news man and while Sorkin himself is fiercely liberal, he writes McAvoy as neither liberal nor conservative but rather as a voice of a populace taking to task all comers regardless of party affiliations in favor of the truth. While I’m ill-equipped to fully explore the political specifics of this show, I can say that this show does an excellent job at explaining complex issues (insofar as you need for plot purposes at least) while keeping the behind the scenes interplay and machinations compelling and relatable. And funny. Sorkin has a razor wit which infuses even this heightened environment with great humor (gallows and otherwise) and no small amount of romantic entanglements. 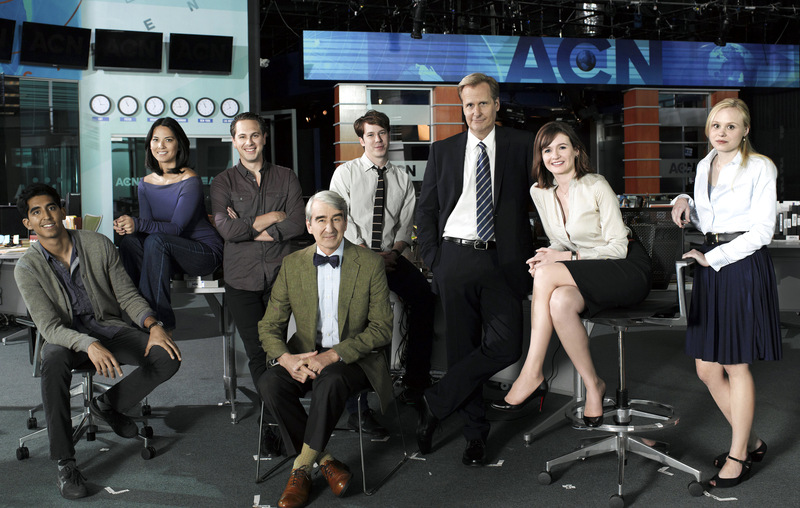 “The Newsroom” is a fantastic show with innovative storytelling, crisp and interesting writing, and a stellar cast. It has 2 episodes left in this 1st season and has already been renewed for a second season to air next year. Catch up on all of season 1 on demand or on the AMAZING HBO Go service. “The Newsroom” airs Sundays at 10pm e/p on HBO.